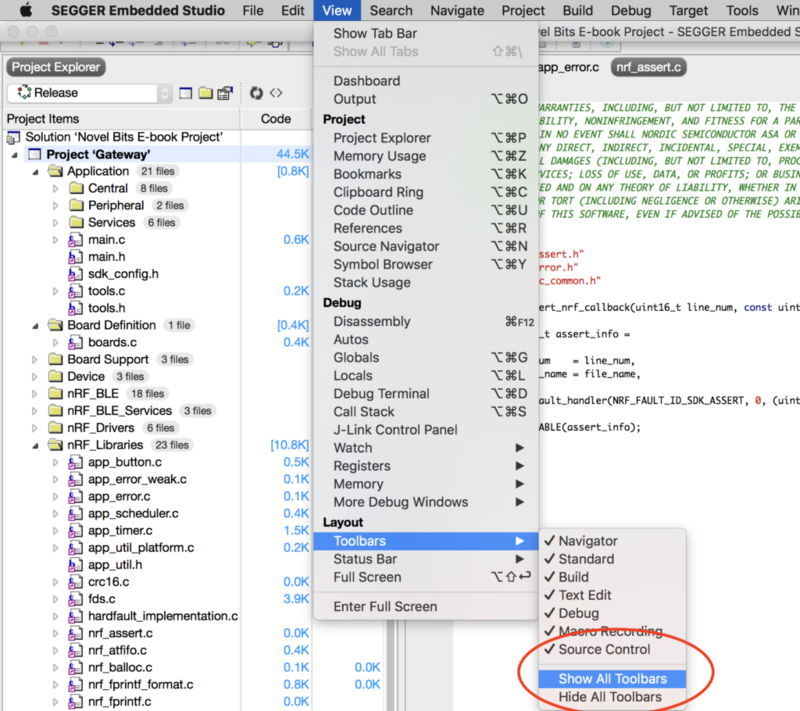 In a previous blog post (The complete nRF Mac developmeent tutorial), I went over how to set up your nRF development environment using the NetBeans IDE on a Mac. 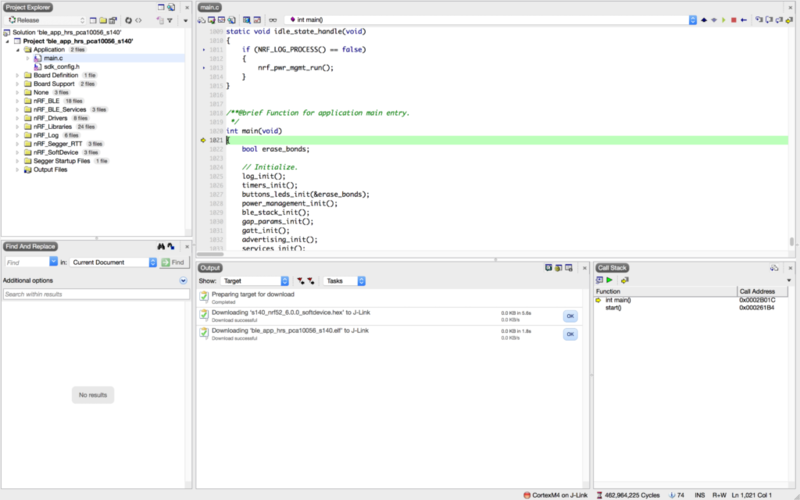 The beauty with NetBeans is that it’s cross-platform and customizable to fit your needs. I had been using NetBeans for over a decade, so I was very comfortable with customizing and modifying the different settings and configurations to make it work. Unfortunately, the setup was quite lengthy and involved many changes to make it work, especially with on-target debugging. Even then, it wouldn’t work quite as well as I would like it to. Not to mention, the setup was different for each of the three main operating systems (Windows, macOS, and Linux). 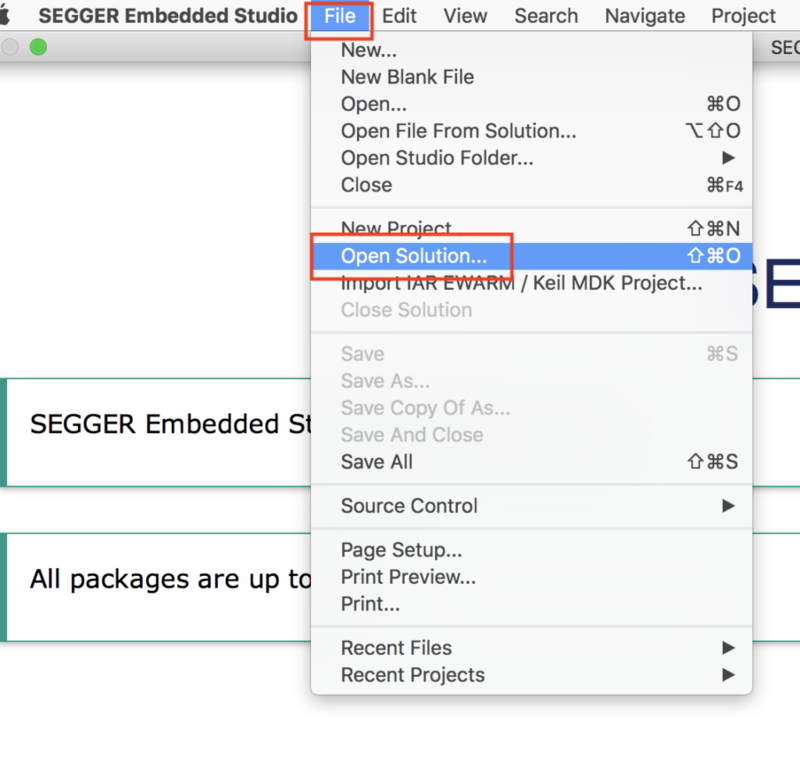 I started searching for a better, more sustainable solution and I stumbled upon Segger Embedded Studio (SES). 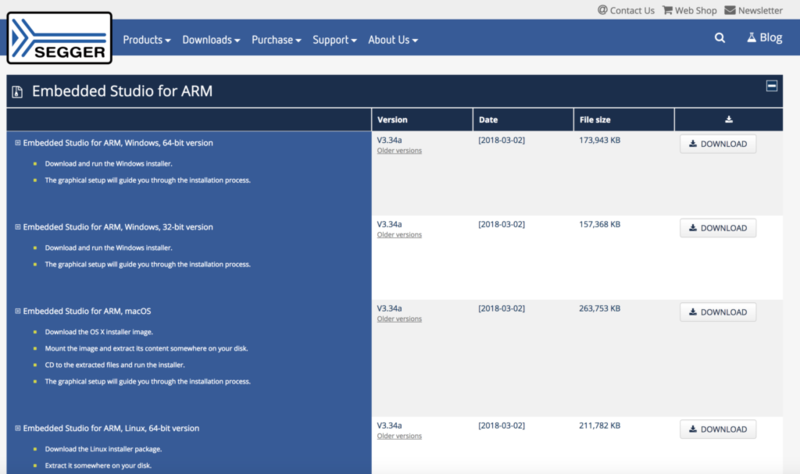 SES is a professional cross-platform IDE for ARM Core microcontrollers, including the nRF5x series chipsets from Nordic Semiconductor. Best of all, Nordic and Segger had recently announced a partnership where nRF developers can get a FREE commercial license to use SES without limitations! You can read more about the partnership announcement here. 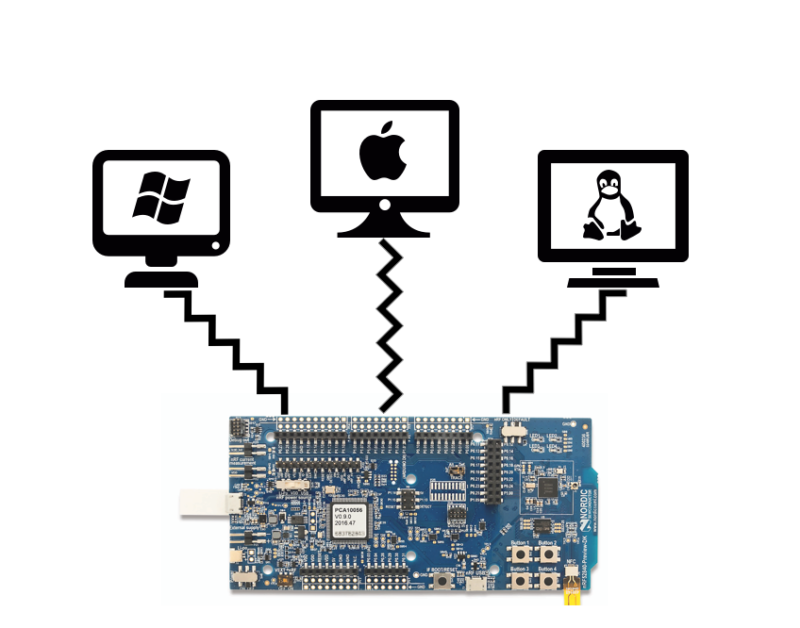 It provides a turnkey solution for development on the nRF52 series platform with seamless integration for on-target (on the device) debugging using J-Link. It has integrated GCC C/C++ and Clang/LLVM compilers. It provides cross-platform support: runs on Windows, Linux, and macOS. There are no restrictions on code size and compiler optimization. It integrates analysis tools for memory use, static code analysis and more. It has tools for importing projects from other IDEs such as Keil and IAR. For nRF5x developers, this is the most cost-efficient solution and provides features that compete with other professional IDEs such as Keil and IAR Embedded Workbench for ARM IDEs. 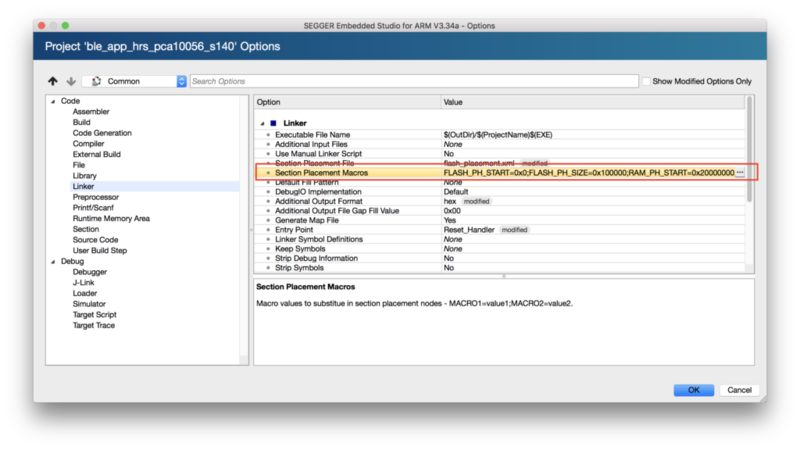 Let’s go through the steps for setting up SES for nRF development on the different operating systems (Windows, macOS, and Linux). The steps below are pretty much identical for the three operating systems with minor differences. Launch the downloaded installation file and complete the installation. Unzip the SDK file to a known location on your computer. 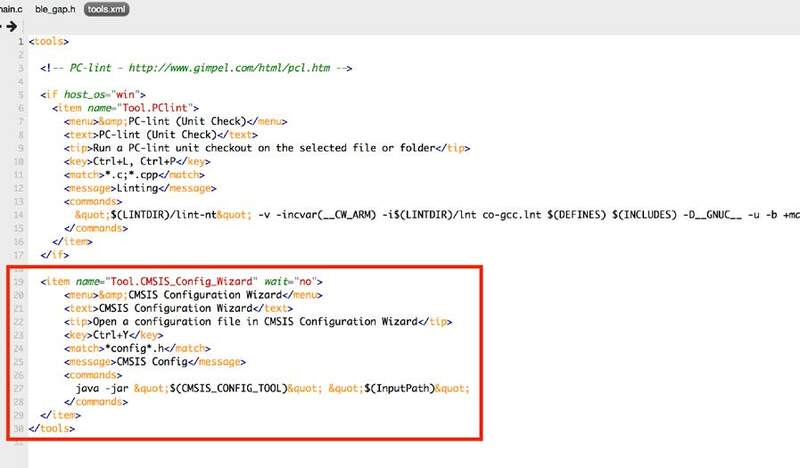 We will need this for a plugin that runs within SES (the CMSIS Configuration Wizard). Once you have Java and SES installed, go ahead and launch SES. Now that SES is launched, we will open one of the examples provided with the SDK under the /examples folder. Now let’s open the example named ble_app_hrs. 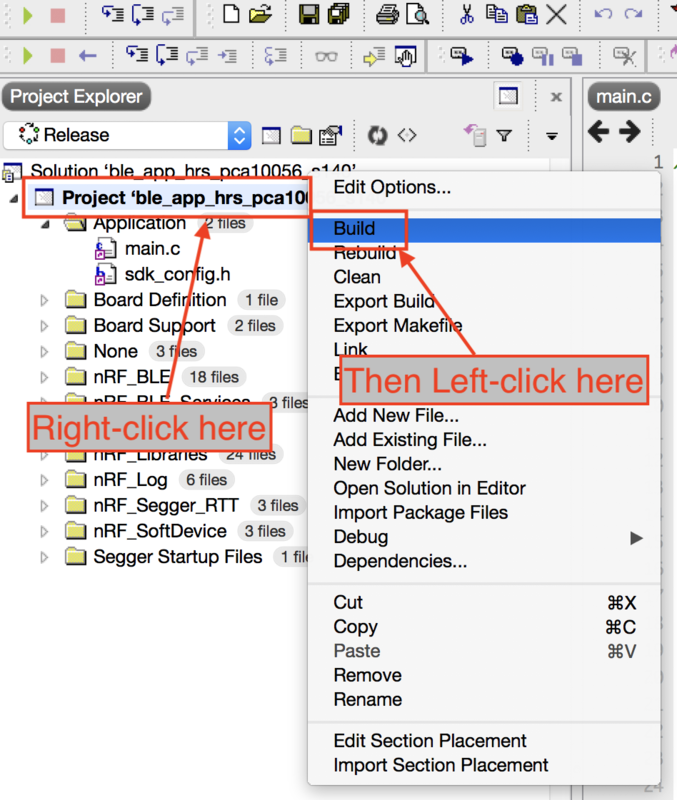 Navigate to File → Open Solution. 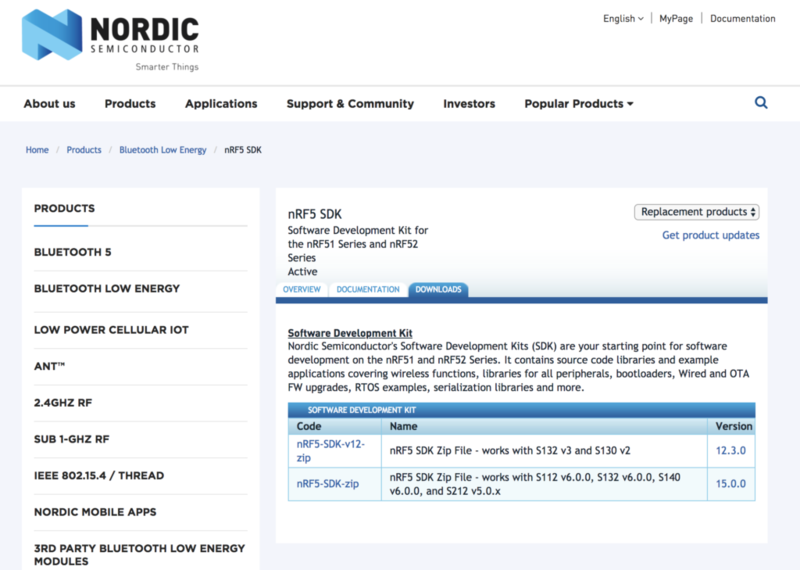 Navigate to this folder, and then select the folder for the nRF5 board that you are using. For this example, I’ll be using the nRF52840 Preview Development Kit which corresponds to the PCA10056 folder. 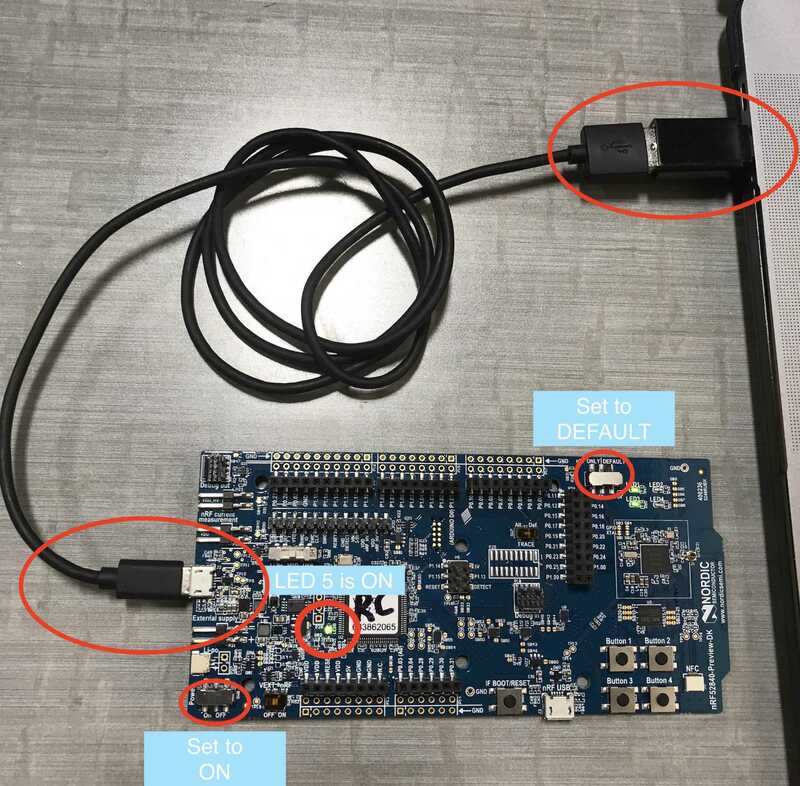 Inside the folder PCA10056 (or whatever folder you need to choose for your development board), you will find a folder named s1xx which corresponds to the SoftDevice used for the development kit’s chipset. The SoftDevice is Nordic’s proprietary BLE stack (it also includes interfaces for the different hardware components of the chip). Inside the SoftDevice folder (s140 in my case), there’s a folder named ses. 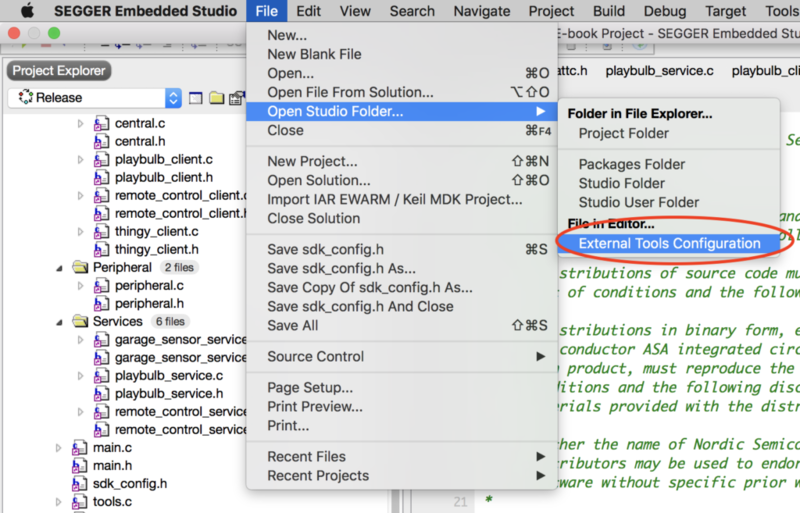 Open this folder and click on the *.emProject file. Click Open. You should then receive the License information in your email. 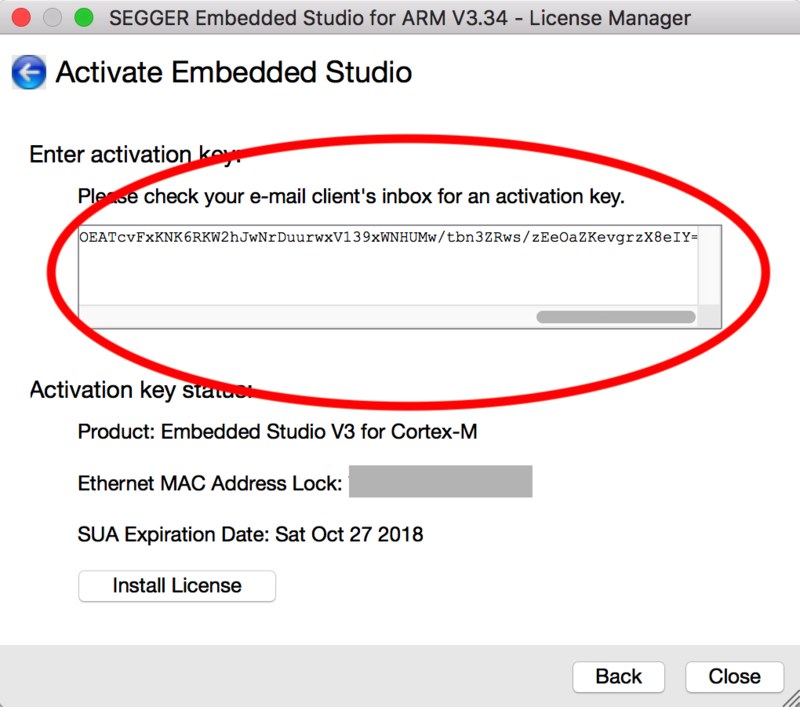 Once you enter the License key, click Close. Now you should be able to flash and run the application on your nRF development kit (nRF52840 in my case). Note: I am using a MacBook Pro that does not have a regular USB connection, so the USB cable is connected to a USB-C adapter as you will see in the picture. In your case, you may have the USB cable connecting directly to your computer. 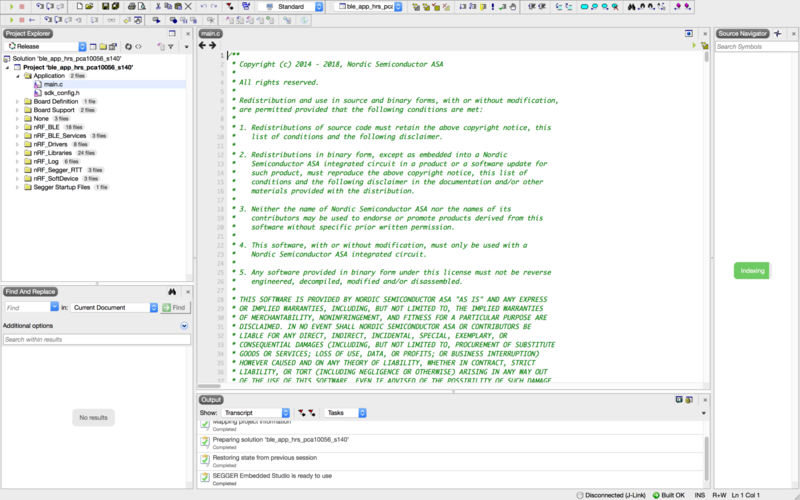 Once you have the development kit connected to the computer, you can run the application on the board. To get a better idea of the state of the running application, we’ll enable logging so we can see any debug messages. In order to do that, we’ll first set up a plugin that helps enable different settings within the SDK. Flags to enable certain modules to be included in an application (e.g. Central role, Peripheral role, Battery Service Client, and more). Flags to configure and enable different hardware peripherals. 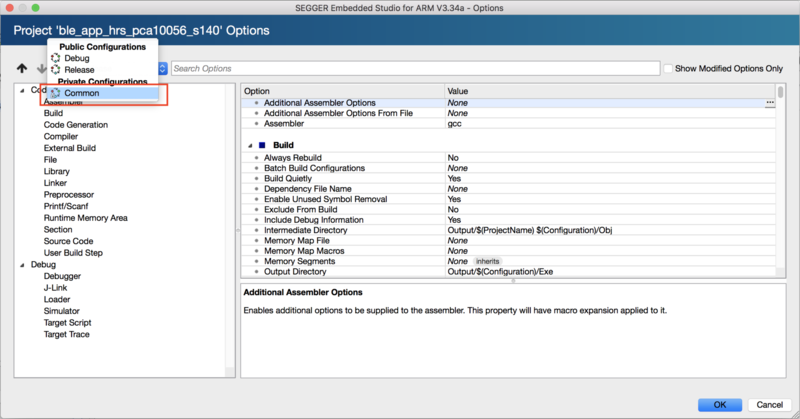 Flags to configure and enable logging and debugging. 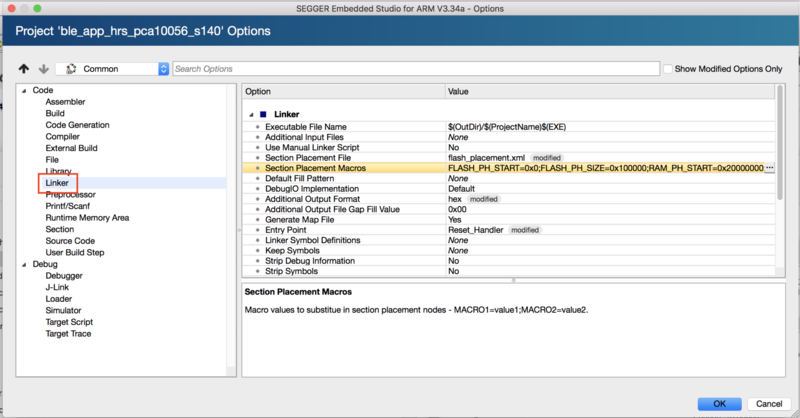 The file can be modified directly from the SES IDE Editor, using any generic text editor or via a plugin called the CMSIS Configuration Wizard (a Java-based add-on). 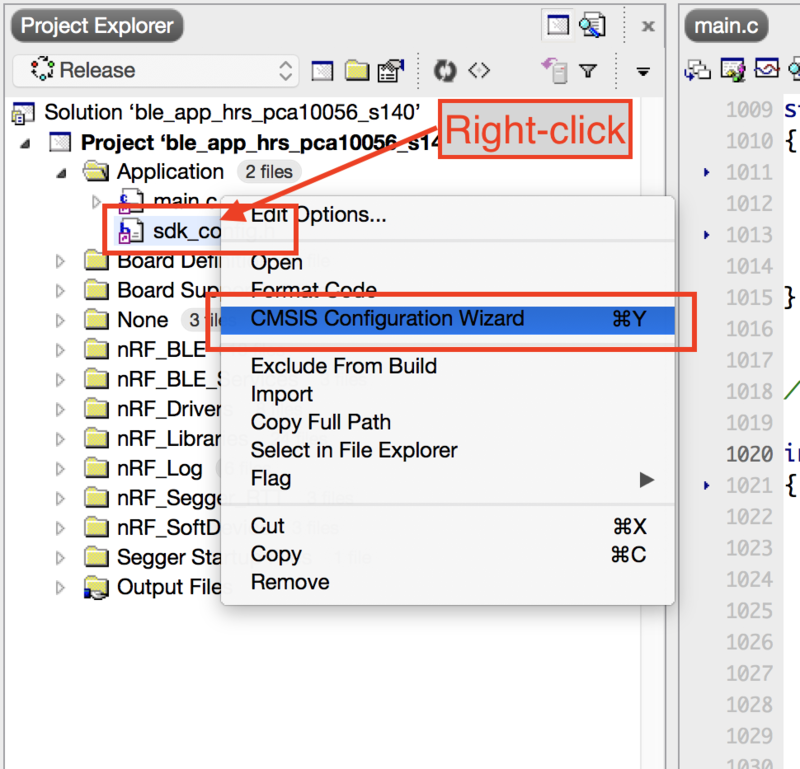 This tool enables you to edit the options within the sdk_config.h file from a user-friendly interface instead of editing it within the raw source code. You will only have to do this step once. Now, quit and restart SES. Now, we’re able to debug the application and see debug messages! NRF_LOG_DEFAULT_LEVEL set to ≥ 3. NRF_SDH_BLE_LOG_LEVEL set to ≥ 2. Logger configured to use the Segger RTT backend. All of these can be set from the CMSIS Configuration Wizard plugin we mentioned earlier. Right-click on the Project, then click on “Edit options”. Make sure you right-click on the Project name and not the Solution. Once you change the RAM Size and Start settings, go ahead and rebuild the application and flash it to your target development board. The application should now run correctly and it should not show any debug messages indicating a RAM Size/Start error. A Solution in SES is a grouping of one or more Projects. A Project is a singular application that can be compiled and flashed to your device, and they contain the source files that are used within the application. Solutions, on the other hand, are used to group related Projects together while still being able to switch between them within the same view. Other benefits of including multiple Projects within a single Solution is the ability to build all the included Projects at once. A Solution is stored as a .emProject file in your filesystem. Projects, on the other hand, do not have separate files. Instead, they are contained within the Solution file. The one thing that I’ve found interesting is that all of Nordic’s example Projects include the source files relative to their root directories in the filesystem. This causes issues when trying to move that folder (e.g. outside of the SDK folder) to another location in your filesystem. The only solution that I’ve found to this problem is to manually edit the *.emProject file and switch from using relative paths to absolute paths. 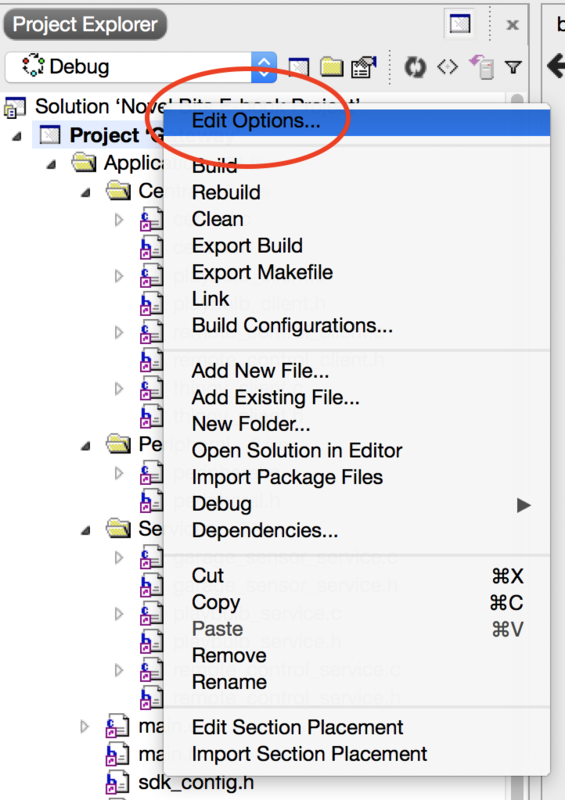 To do this, open the Solution (.emProject) file in an editor of your choice and change all the paths to absolute paths. You could do this by searching for and placing certain length strings like “………….” with the base SDK dir. Yes, it will be a pain to change all these paths to absolute, but I recommend doing this for a template Solution (or a Solution for the example that you will be using as your base Solution), and then re-using that Solution for the different applications that you will be developing from thereon. 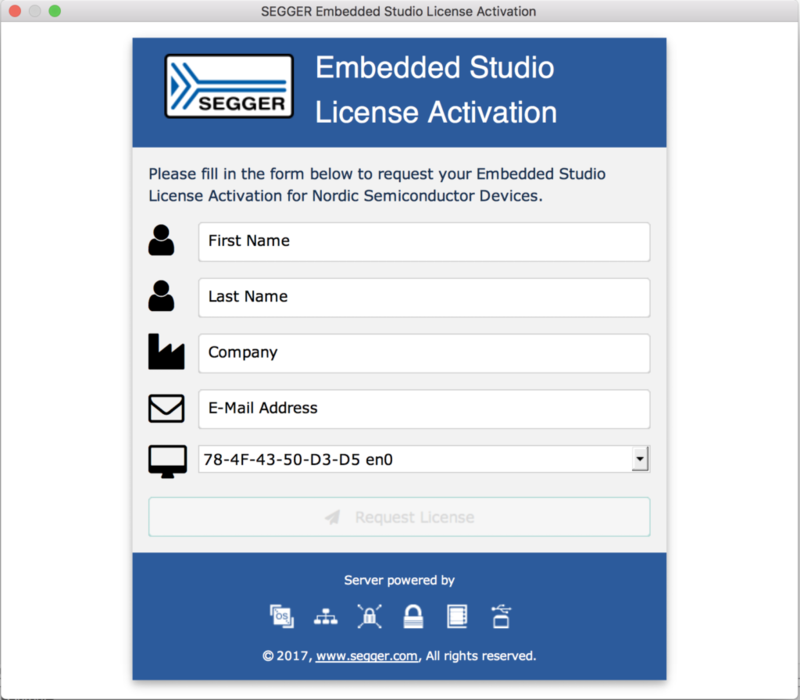 In this post, we covered how to set up Segger Embedded Studio for nRF development as well as a couple of tips and tricks. The steps we went through should work on all the major operating systems (Windows, macOS, and Linux). 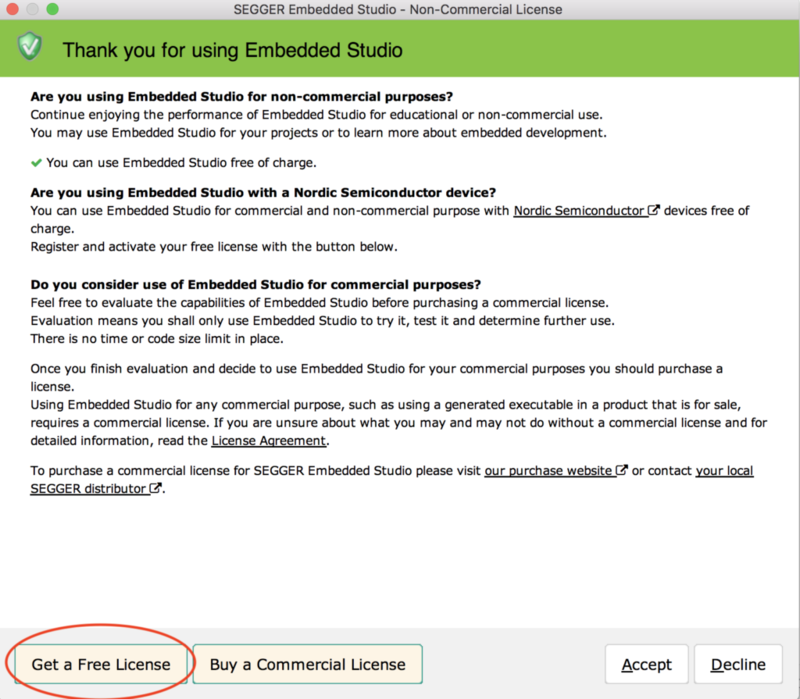 As mentioned previously, the best part is that you can get a FREE License for SES when developing nRF applications. 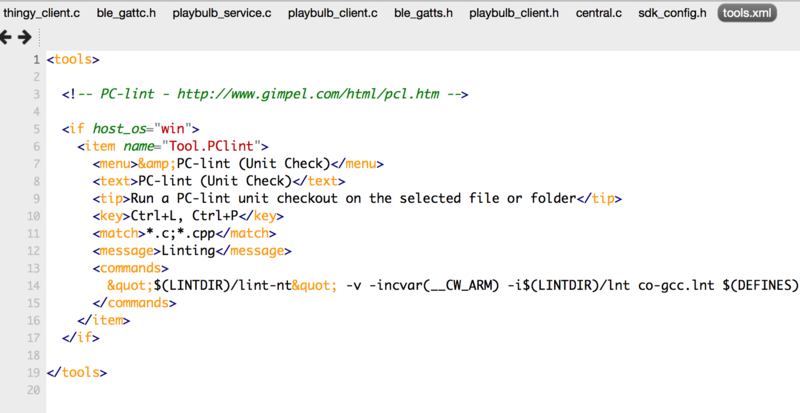 This gives you access to a professional cross-platform IDE that compares to other (costly) IDEs at no charge! In an upcoming blog post, we’ll go through building a simple nRF BLE application and learn how to debug it using SES. 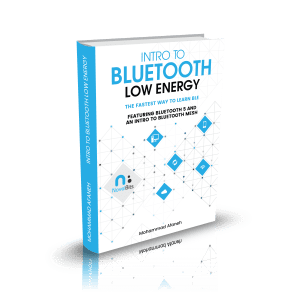 We’ll also go over some tips and tricks that can help you develop and test BLE applications faster. If you’ve enjoyed this blog post and found it helpful, please share it with your co-workers, friends, or anyone who may find it useful. Another great tutorial. Thank you, Mohammad Afaneh! I really thanks for this, but i am trying to develop the BLE mesh with redbear BLE Nano V2 kit(DapLink) . So, is there any support with SES IDE. Great tutorial. However, I’m stuck at one point. At 24) when I click on start debug, I get the error message “Cannot connect to J-Link via USB”. Any way to fix that? Thank you for your tutorials. They are well written and documented. 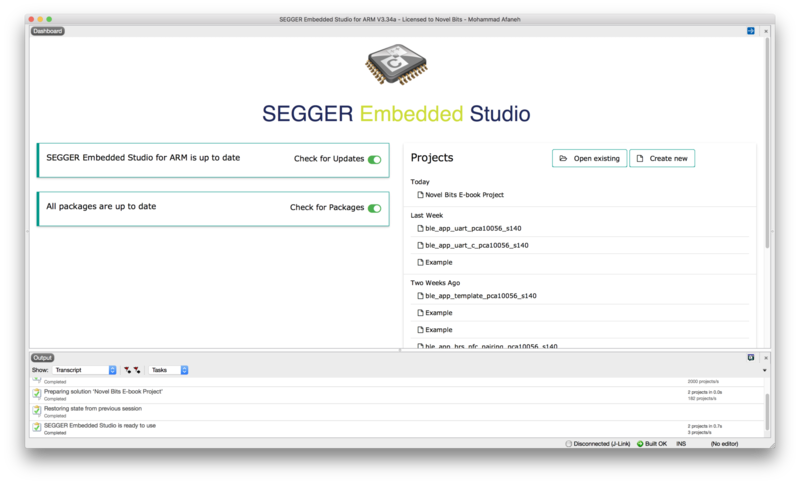 I am just starting a project with this board and Segger Embedded Studio was suggested for development. Zephyr was also recommended as an RTOS to use. Are you aware if it is possible to use SES with Zephyr (as well as any tutorials on setting this up :-)? 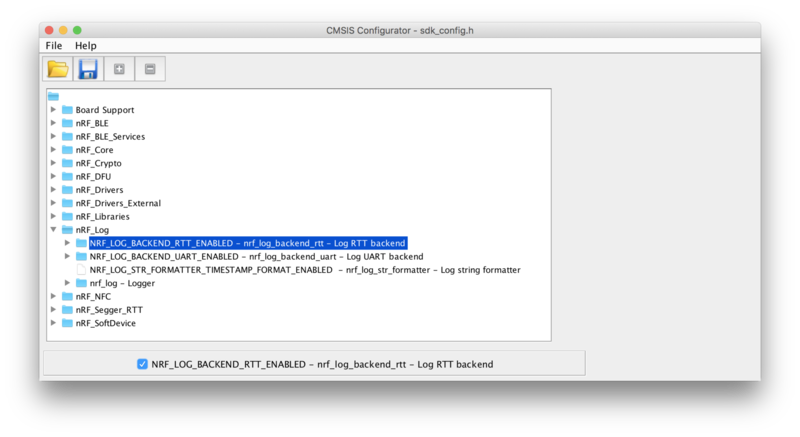 I try to enable the FLAG: “NRF_LOG_ENABLED logging module for nRF5 SDK” following your instruction. 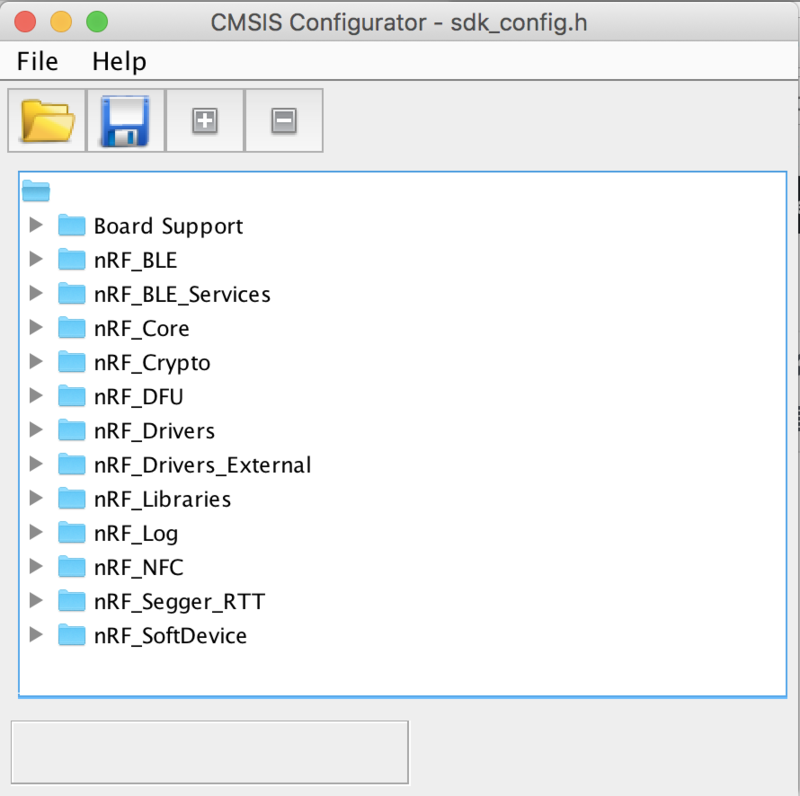 However, I cannot find this option in CMSIS UI or any option that contains string “nRF5 SDK” in sdk_config.h file (with text editor). And I cannot see the log info in terminal’s output (But I do can see some output printed by “printf()” ). I guess there might be some version problems. My SDK version is 15.2.0. , SES version is 4.10a. So, how should I solve this problem? 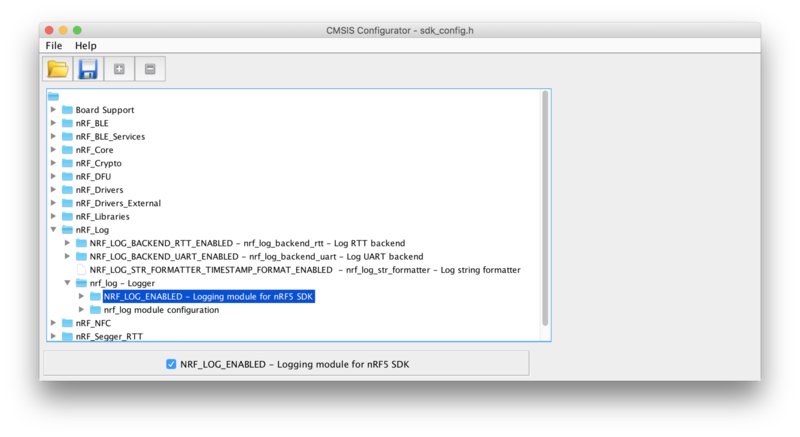 Is there any updating option for “NRF_LOG_ENABLED logging module for nRF5 SDK”? Thanks. I downloaded SDK 15.2.0 and I’m using SES v 4.10a as well. 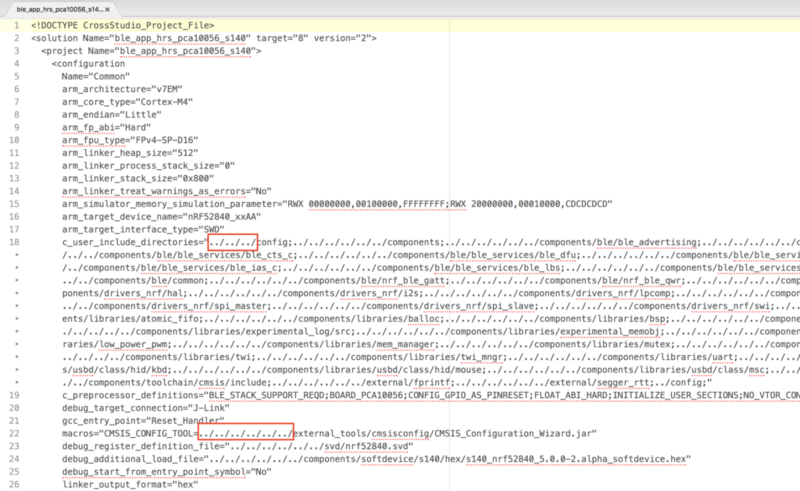 I can see the NRF_LOG_ENABLED macro at line #7451 (and it shows up in the CMSIS Configuration Wizard), not sure why it’s not there in your file. Can you maybe re-download the SDK and check it? Really enjoy your teaching talents. tried to follow instructions but my debug Terminal is empty after rebuilding and debugging. No error messages – nothing. Cortex M4 on J-link blinks and Call Stack is “runing”. LED 5 blinks every 4 seconds. That’s all. 😀 glad it works now!